In 5-quart Dutch oven, heat 2 tablespoons of the oil over medium-high heat. Add chicken and salt; cook 5 to 7 minutes without moving, until browned on first side. Stir; cook 2 to 4 minutes longer, stirring frequently, until chicken is no longer pink in center. Using slotted spoon, transfer to medium bowl; set aside. Add remaining 2 tablespoons oil to skillet, then stir in mushrooms and green onion whites. Cook over medium-high heat 5 to 7 minutes, stirring frequently, until softened. Stir in broth, carrots, cabbage, oyster sauce, soy sauce and ginger. Heat to boiling over high heat. 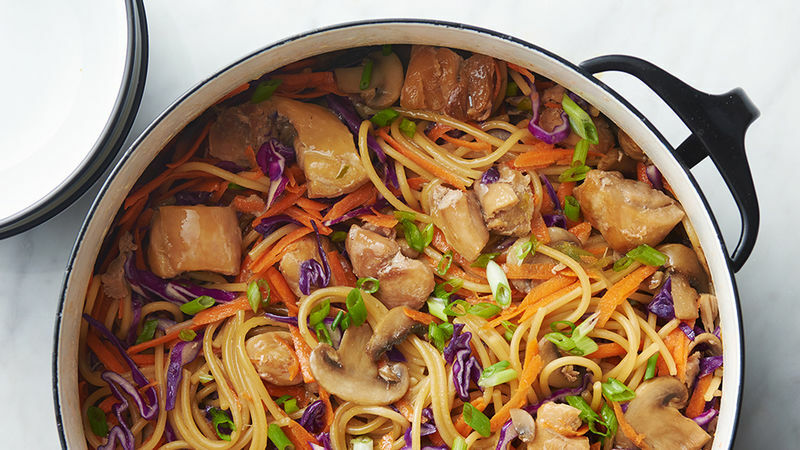 Stir in chicken and spaghetti; return to simmering, then reduce heat and simmer uncovered 14 to 16 minutes, stirring frequently, until spaghetti is cooked through and sauce is thickened. Top with green onion greens. For best results, pat chicken dry before adding to hot oil. Short on time? Use purchased preshredded carrots and red cabbage.